Hi Everybody! 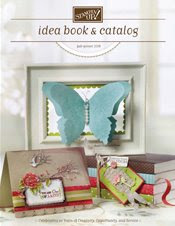 I will be starting a "Stamp and Scrapbooking Club" in February. If you are interested in the benefits of being part of my "Stamp and Scrapbooking Club", email me at lbmcd66@hotmail.com with the subject "Stamp Club" and I'll send you the details and you can decide if you want to join! There's yummy benefits in joining. Hopefully, I'll be hearing from you! P.S. Club membship is restricted to residents of the United States only!! Good Morning Everybody! Hey this is my 4th 12 x 12 layout I ever made. I'm rather proud of it because I think it turned out better than I expected. I've started scrapbooking recently (a few months) and I'm beginning to feel a little better about it. I've always been intimidated by scrapbooking 12 x 12 layouts because I just felt it took too much work and that I always thought "how the heck do I fill up such a large piece of paper?". LOL. Good Times. I love the pretty colors in this kit and the patterns are pretty cute. I used that "visual triangle" rule for scrapbooking. Honestly, I never thought there were any rules for scrapbooking. See. . .that's how much I know about this stuff. I thought you could just put things together in any fashion that made you feel good. 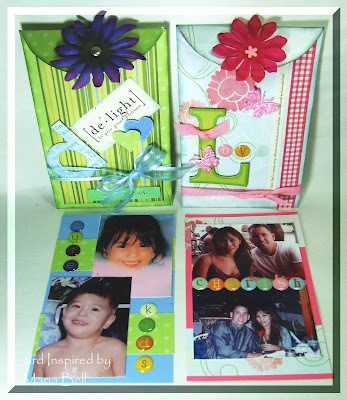 I still don't understand all these crazy scrapbooking rules . . .it just seem so technical if you ask me. Why can't you just slap things on? Isn't it more artistic to not follow any rules? 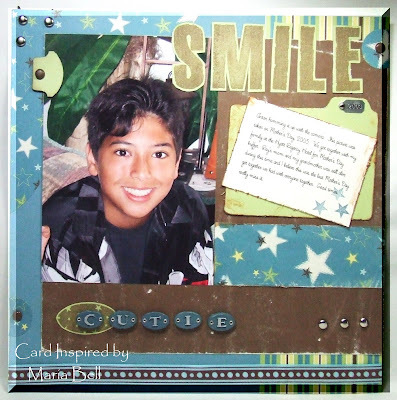 You know . . .your own gut feeling, your own inspirations rather than following the "visual triangle", "the rule of threes", "setting the mood", and all of those other technical stuff that makes for a great scrapbook layout! Sheesh, I always thought that you just stuck embellishments where they look like they would fit nicely or where ever there's space and stuff like that!! LOL! 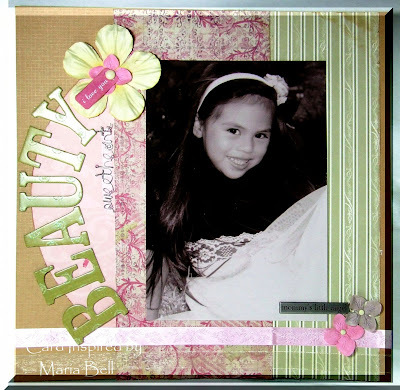 Sometimes when I look at other people layouts. . .there seem to be no "rules" being followed. . .even the "pro" scrapbookers. . .they just look pretty randomly laid out to me. Anyway. . .if you take a look at my layout and focus on the silver brads at the left corner, the silver brads at the lower right of my page and the mini tag at the upper right. . .well that's a visual triangle. This particular visual triangle suppose to bring my journaling into focus. I have at least 3 visual triangles. Can you spot them? Okay. . .for the scrapbookers out there in the know. . .is there a limit on the amount of visual triangles you are allowed to have on a page? Just curious if there was a limit. Hi Everybody! 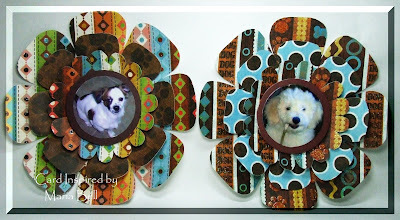 Here are photo plaques I created. 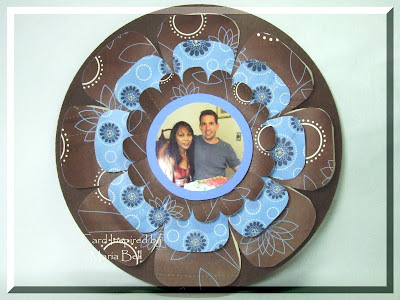 The flowers were created using a template I found online: Click Here for the templates and instructions. 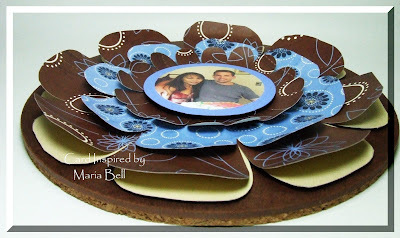 If you drop by my Stampin Inspirations blog site, I also made cards using this flower template. I'm in the process of making a mini album using the template which I'll post when I'm done. I bought this cork mat at Lowes which cost about a $1.50. It's a fabulous board to decorate and use as a plaque to attach a photo and hang on the wall. The measurement of the cork mat is 8 inches and the largest flower of my project measures 7.5 inches so it's a fairly large plaque. I took the flower project and glued it on to the cork mat and I'm planning to hang it on to my wall in my craft room. This is the finished project at a side angle. It's very 3D looking. I love it. 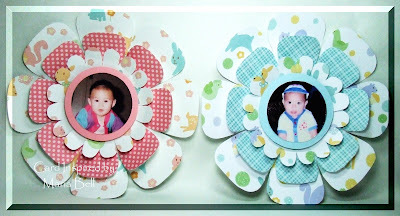 I made a whole bunch of these flower projects. 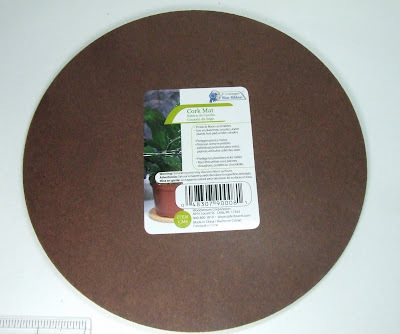 I still need to buy a few more cork mats to attach my flower projects. I'm still debating whether I should create the mini albums and attachin these flower projects or attach them to the cork mat. This pictures shows the ones I made for my kids. I used DCWV Nursery Designer papers. 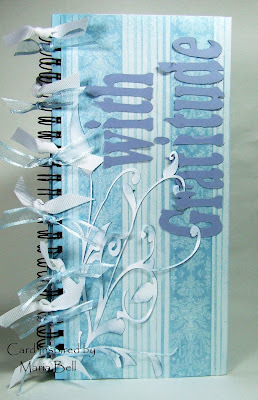 The papers are very thick, almost cardstock quality and is glittered or has a 3D texture. Very, very pretty papers. This picture is of my cats China and Dori. I used DCWV Pet Stack. 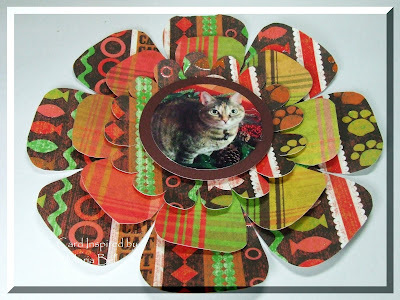 This paper is to die for especially if you have pets and would like to create scrapbook layouts or projects for your pet pictures. The papers like the nursery stack are very thick and are glittered or have a 3D texture. This is my lovely sweet buddy Dori. She is the sweetest cat, so affectionate and so loving. I never thought I could love a cat but Dori is unique. She loves to hug us. She literally wraps her paws around our tummy or lap. I love Dori like I would a human family member. I love all my pets the same way but Dori is the special one. These are pictures of my dogs, Dakota and Phoenix. Dakota is very sneaky. . .Phoenix is a very kind hearted dog. Again, I used the DCWV Pet Stack for the flowers. Hi Everybody! I've been tagged by Malieta at "Life's Simple Pleasures". This one is fun! Consider all those who read my blog tagged. Copy the questions and post it on your blog site!! Hi Everybody! 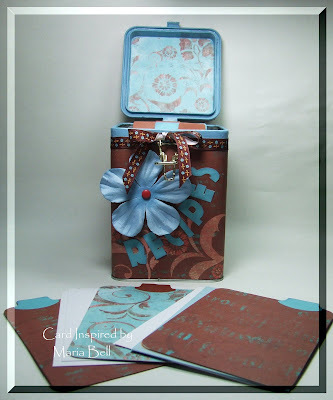 I posted this "Box Pocket with Funky Fold Card" tutorial on both this blog site and Stampin Inspirations. Nooo, you're not seeing double. It's just that I created a "rubber stamped" version as well as a "scrappy" version so I decided to post it on both sites. I know not everyone who visits this site, visits my other blog site but I create different stuff for each site and sometimes I usually don't post the same tutorials on both sites. 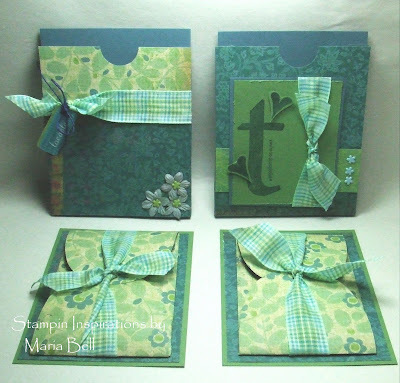 It's usually different so be sure to drop by Stampin Inspirations when you have the time. Why don't I just combine both sites, you ask. . .well, I like to keep the "scrappy" stuff separate from the "rubber stamped" stuff. Besides, it pushes me to do both otherwise, I would probably just make "rubber stamped" projects and I really would like to be open to doing both. Anyway, this funky fold card is inserted into the box pocket as you can see above. The flaps are held down with the ribbon. If you follow the tutorial, I linked template of the funky fold so be sure to check out the tutorial. It's really quite easy to make and quite fun! 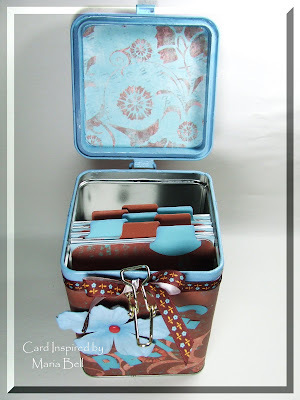 I created the box pocket template myself because I wanted to create a pocket that would hold my funky fold card. It's not necessary to have a pocket for it but I thought it was just fun to put it in a pocket. This is the funky fold opened up. I kept the inside simple to leave room for a nice message or note. I'm sure you could do something more creative than the ones I created. Anyway. . .try out the tutorial and tell me what you think! Blog Vacation and Real Vacation!! Will be Back on Tuesday, Jan, 22!! Hi Everybody. . .I'm going on a blog vacation and a real vacation this time. We're heading to Vegas on Thursday but I need to do some errands tomorrow before we leave. I won't be bringing my laptop on my trip because there's too many things to do in Vegas andmore than likely I won't have any time to be sitting in front of the computer! Wish me luck! I never win in Vegas but maybe this time around I'll have better luck! Yeah, right!! I'll be back on Tuesday, Jan 22. Hope y'all have a wonderful weekend and for some of you a 3 day holiday!! Hi Everybody! I created these "Scrappy Pockets" this afternoon. I used the Stampin Up "5 in 1 Template" to create these pockets using designer paper. 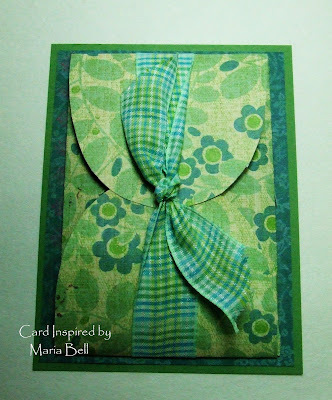 Initially, I wasn't sure what I could create using these pockets other than as an envelope for a card then I thought a scrappy project would be something different. On a cardstock I created sort of a layout for my pictures which are inserted into the pockets and can be pulled out from the notch I created using a circle punch. Here are the layouts outside of pockets. I think I may eventually attach the pockets on to a large scrapbook layout and use them to sort of make a fun "pull out" aspect of a scrapbook album. What you think? Is that a good idea? Any suggestions what I could do with these Scrappy Pockets? Hi Everybody! I've been tagged by Brigitte at C'est 'fun' de creer! 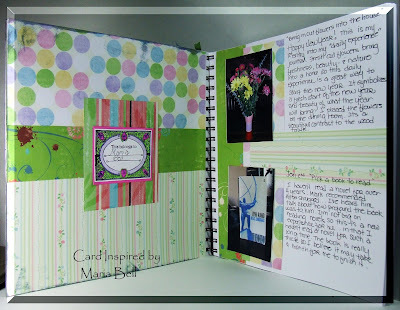 She creates beautiful scrapbooking layouts and cards. Be sure to stop by her site and check it out. I have to provide 7 facts about me. I'm not really an interesting person so this may be difficult. 1. I'm short. I stand at 5' 3/4". Don't you notice that short people will add the extra 1/2' or 3/4" to their height. You don't hear tall people adding the extra. 2. I love documentaries, crime shows, Indie movies. . .I'm don't like to watch "prime-time" kind of shows except for CSI and Supernatural. I watch those two shows religiously. 4. When I was a kid, I was really adventurous and actually am surprised I had not hurt myself badly. I once climbed a really tall tree all the way to the top and had difficulties getting down. The tree began to sway and I almost flipped out thinking that I could easily fall off and kill myself. Luckily, I made it down safely and in one piece. 5. I got fired working at Jack in the Box when I was a teenager. It was the worst job ever. I also worked as a waitress for one month while in college and I was asked to resign. LOL! 6. I can't keep still for long periods of time. I go nuts watching a movie in a theatre because I can't get up and walk around or do something else while I'm watching the movie. 7. I've seen a lot of crazy things working as an RN in the hospital. Diseases, infections, and injuries lay people never heard of or didn't know existed. It was very interesting. I decided to not tag any one else because I'm not sure who wants to be tagged or who have not been tagged yet. Instead, I'll tag all of you who reads this post and post 7 random facts about themselves on their blog. Hi Everybody! 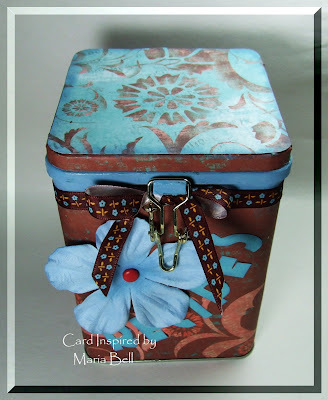 I worked on this altered container yesterday. I bought a bunch of Christmas tins that were on sale at JoAnns for 70% off. They were all between 50 cents to 89 cents. Seriously!! The problem with the tins were that they were already designed with Christmas prints and colors and my purpose of buying them were not for Christmas but for other purposes. Unlike tins that are just plain silver colored, these had to be altered in the real sense of the word. The rims and cover were green so I had to paint the rim and part of the cover with acrylic paint and seal them with modge-podge so it won't chip off. The plain silver tins are easy to work with because the rim of the container is silver therefore it don't have to be covered with paint or paper. This is the front of the container. 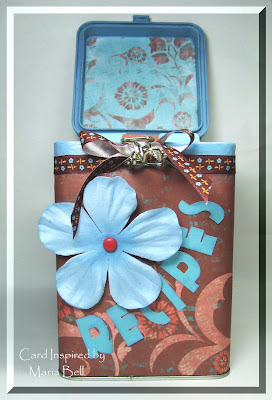 I modge-poged the designer paper over the tin and added embellishments. This is the top of the container. I used Autumn Leaves designer paper which is only one sided. I hate using double sided designer paper for altering because it's such a waste of beautiful patterns on the other side of the paper. This is how the container looks when closed. The size of the container is 4 1/4" x 6" x 4 1/4" . If the container was 1/4" wider, I could put handmade cards in this box but unfortunately, it's a tad small and an envelope cannot fit into the container. I added dividers by cutting up thin chipboards. It's half filled because I haven't added any recipes as of yet. Here are file dividers which I covered with the Autumn Leaves designer paper on both sides of the chipboard. I used the SU Label Punch to create the tabs and cut out cardstocks to attach or write my recipes on to. Hi Everybody. . . this is my second layout for this year! I'm rather proud of this one because I actually came up with my own layout. Does the page look too simple? It looked fine in person but when I look at the picture, it looks sort of "plain". I don't know. . .I guess I'm accustomed to seeing all those layouts with lots of embellishments, sentiments, words, and stuff. Should I add like a little saying or verse somewhere or perhaps more stickers? Your honest opinion is appreciated. Anyway. . .this picture is of my daughter when she was 5 years old. This picture was taken during Christmas and I took it at a courtyard where I worked. Considering I'm an amateur photographer and it was taken with a 35mm not a digital. I think the picture came out really well. I scanned the photo and enlarged it on my computer. I then changed the color of the photo to "sepia". I wanted to create a "vintage" or "softer" look to the layout. This is one my favorite pictures of my daugther. I like a lot of pictures but I think this one looks natural. . .she's posing but not really posing. . .if you know what I mean. Good morning, Everyone! 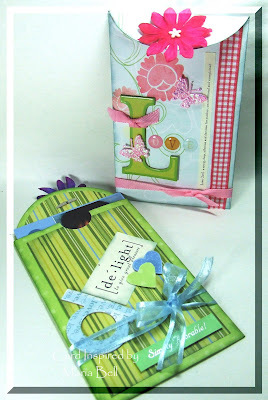 Here is a video tutorial on the tri-fold cards that I created on previous days. 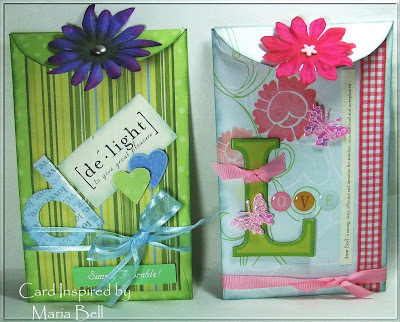 It's a very simple tri-fold card but a few of my readers requested that I create a tutorial. . .so I did. Creating this video tutorial was so painful to create because my video program was having a bad day. It refused to cooperate. My husband said that it could be I'm low on memory so he purchased additional memory for my computer. Here is the completed card on the video. I'm not sure I'm liking the design but like I said in the last posts, I'm not too good with putting together a "scrappy card". For some reason, putting a layout together is different from rubber stamped cards. I need a little practice. 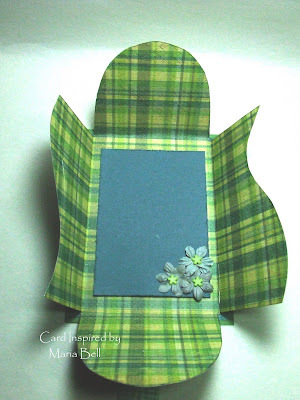 This is a card I posted a few days ago but I wanted to repost it because I wanted to show another sample of the tri-fold card that is on the video tutorial. Good Morning Everyone! I decided to make one more of the tri-fold cards. This time I went simple. 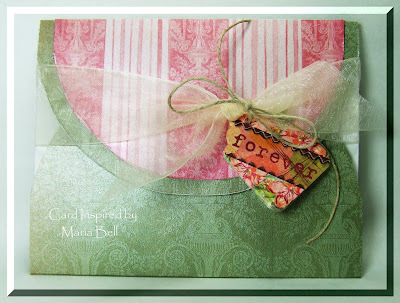 Simple cards tend to look more elegant so I tried to keep the embellishments to a minimal. I couldn't seem to take a good picture of the card. The designer paper has a pearlescent sheen to it so it sort of reflect the light a bit and it's hard to take a good picture. Anyway. . .do you like simple designs? I sometimes do. It's hard not to keep adding stuff to it but sometimes you gotta know when to stop. Hi there, again! 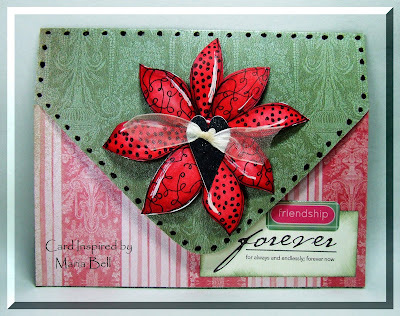 I actually posted this card on Stampin Inspirations (my other blog site) by error. . .how annoying! I guess that is the hazard of having two blog sites. 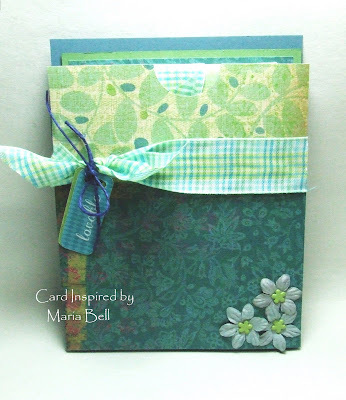 This card do not qualify as a "rubber stamped" creation so I can't post it on Stampin Inspirations. 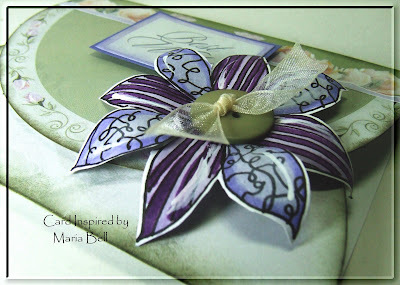 Anyway. . .don't forget to scroll down to view another Tri-fold scrappy card I posted earlier today. It's a slightly different flap so be sure to check it out. 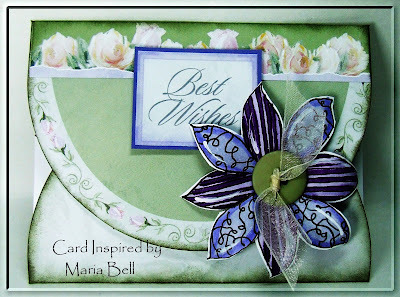 The card base for this card actually came from the "Close to My Heart" card kit "Floral Impression" which is now retired. With my previous card, I had traced one of the card base that came with the card kit and created my own card using a designer paper. Why buy a card kit when I make my own cards? Well, some card kits come with unusual folds or shape or something that can be used as templates for future cards that you make. It sure beats trying to create the folds or shapes yourself. LOL! The card base and the sentiment sticker is from the card kit but it won't feel like I created the card myself if I don't add a little something to the card that I made myself so. . .again, like my previous card, I drew the large flower using my Copic Multi-liner and Markers and added a button for an added dimension. 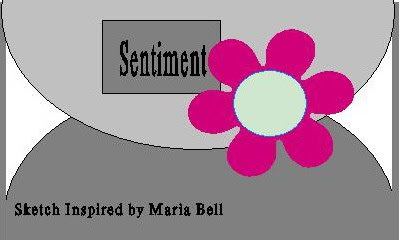 Paper: Close to My Heart "Floral Impression"
Good Morning Everyone! I'm sorry I haven't posted on this blog site for the past few days! I've been working on rubber stamped cards for the past few days because I've been practicing coloring with my Copic Markers. The flower on this card is not rubber stamped. I actually drew it with my Copic Multiliner and colored it with the Copic Markers. I decided to post it on this blog site because technically, the image is not a rubber stamped image. I'm still a bit "Scrappy Card" challenged. I still need a little practice with layouts. 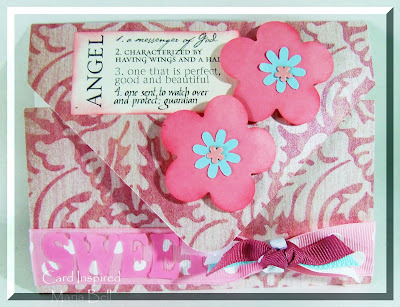 I don't know why it is harder for me to use scrapbook embellishments. I'm just so accustomed to rubber stamping my images. This card is a tri-fold card. Doesn't it look sort of like an envelope? For the template I used a card kit that already came with a tri-fold card base and I just traced it. I can create a short tutorial on this tri-fold but honestly, you can just look at and create it on your own but if you want instructions, I'll create a tutorial anyway. I created the dots around the flap using a Sakura Black Gel pen and shaded the sentiment sticker with SU True Thyme ink. Hi Everybody! One my resolutions this year is to send out RAKs randomly to anyone at least several times a month. If you could send me your mailing address, email me at lbmcd66@hotmail.com. On your email subject, please fill in with "Blogger Address". Please . . .this is important because I will be filtering the emails into a "Blogger Address" folder. If you don't write it in the subject, I may miss your message. P.S. Please include your blog link or address in the message. Hey Everyone!! Remember the other day I had posted that I was going to create a "Daily Experience" album. Well here it is. I finally had time to create a simple cover. I didn't make it all fancy and such because I have to write in it on a daily basis so I don't want it nicely decorated and it starts to fall apart because of abuse. What is a "Daily Experience" Journal/Album? Everyday I come up with simple daily "life experiences" that I don't typically experience on a regular basis, take a picture of the experience, and journal it. That's it. It's just my way of stepping out of my "cozy" box or the monotony of daily life to do something a little different. It's not major events. . .just small simple experiences like reading a book that I typically would not read, watch a show that I never watched, listen to a genre of music that I don't typically like to listen to, etc., etc. . . you know, something different or new. This is a 10x10 book/album. The papers inside are thick and unlike regular scrapbooks there's no protective sheets, just paper. I decided to go this route instead rather than creating a mini album. There's 40 pages to this book so I can add about 160 - 180 entries. I bought two of these books therefore it'll cover me for the whole year. Here is my journaling and pictures of my "daily Experiences". Nothing fancy. Initially, I was going to create pretty layouts and journaling for each day like you would a scrapbook album but okay, that's a bit ambitious I have to admit. I can't even create a regular scrapbook layout once a week. It was a great idea but I don't think I would be able to journal on a daily basis if I go that route. Instead, I simplified it a bit. Because I have tons of scraps, I figured I could just slap on a few of them on a page, leave a space for journaling and add my pictures. That's it. Nothing fancy. 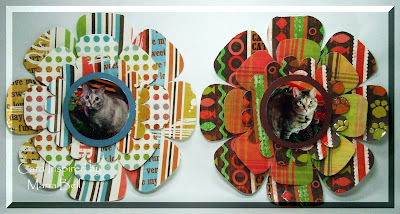 Okay. . .I can keep up with this concept and it's a great way to reduce my scrap pile! Whoohoo! I can't add embellishments or anything like that because I have to write on the front and back of each page, therefore the pages can't be bulky and I can't have the book so fat that it won't close properly. Well. . .hopefully, I'll stick with it and it'll be fun to look back at the end of year and see all the new and different things I've experienced this year! Good Evening Everyone! Well, it was a somewhat non-productive day for crafting! It's hard to get back in the groove. I hope y'all had a wonderful New Year celebration. We watched a movie and had dinner to celebrate the end of 2007 and the start of the new year. Did anybody watch "Sweeney Todd" or the "Golden Compass"? Sweeney Todd was an interesting movie. I really liked the movie. . .a bit gory, but very entertaining. Both Johnny Depp and Helena Bonham Carter were fabulous in their roles. It's amazing how well they sang. I recommend the Golden Compass as well. It's a kid's movie but I think adults will also enjoy it. Nicole Kidman was great playing a sinister role. Okay. . .the journal on the right is one of my resolutions. It is to start a "gratitude journal". Everyday I write an entry of what I am grateful about for each day of the year. It's just a reminder for me to see how fortunate I am and that life is good. I basically altered a note book using designer paper and modge-podge. The sentiment and swirly branches were cut with my Craft Robo and to finish up the journal, I added ribbons to the wire binding. I will be creating a "Daily Experience" album. One of my resolutions was to come up with an "experience" that I don't typically do in my day to day life. I have tendency to do the same things everyday and once in awhile do something different. I want to experience more things this year. Nothing major. . .just little experiences that are new or different from my regular life experiences. I will be creating mini scrapbook albums consisting of pictures of my daily experiences that I come up with everyday and I'll add a little journaling of the experience. I haven't created the album yet because I was working on my "gratitude journal" today. Today's experience is to "pick a book to read". One of my other resolution is to read at least one novel or book in its entirety once a month. 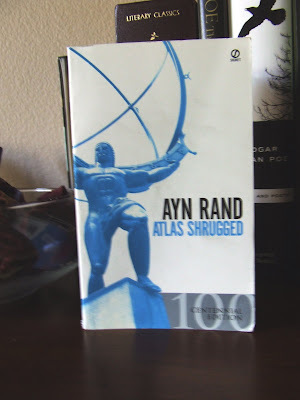 I chose to read "Atlas Shrugged" by Ayn Rand. Did anybody read this book? It was highly recommended to me by my husband. Okay. . .it's thick book. I really believe it will take a month to read this book but I will give you a synopsis of my impression of the book when I'm done. . .okay. This is my first "daily experience" of the year. What is it? Obviously, it's a vase with a bouquet of flowers. 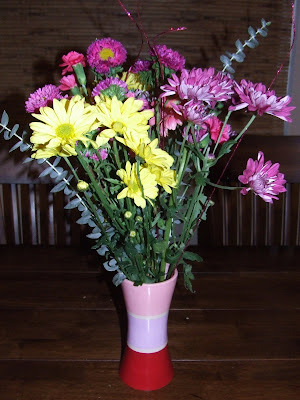 The daily experience was to "bring in cut flowers into the house". Why did I choose this experience? Well, I don't typically buy fresh cut flowers on a regular basis and I felt that something fresh, natural, and beautiful in the house is a great way to start the new year. It symbolizes a sense of renewal for the new year and the beauty of what the year will bring. Anyway. . .anybody have a gratitude journal? I think gratitude journals and daily experience albums are a great way to look back at the end of the year of what my life was like. It's great to look back and to know that there were many positive aspects of it to feel good about. Sometimes we have a tendency to not see the positive experiences in our lives and this is just my way of reminding myself of them.